Where can you Find the Gold in 2015? 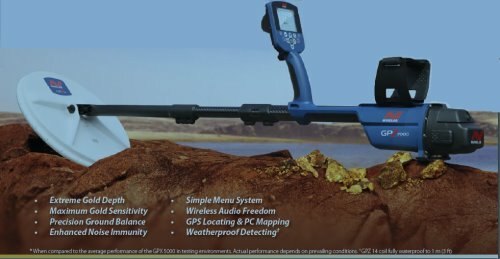 Once again plenty of mystery and secrecy surrounds the release of the new Minelab GPZ7000 which will be released shortly (next few weeks) at a cost in the $10000 Plus Range (as far as we know). Ok so what do we know? Very little yet, it looks like a similar design to the 3030 with the same design and shape and I guess this is within expectation that the next (after the Minelab 5000 model) would add some of the design technology that the 3030 has – not unpredictable. We don’t know details it’s always very secretive with Minelab! You can rest assured that we will be buying one to test, use at the Gold Prospecting seminars and for you to look at and assess as soon as it comes out. It would have been nice to be able to plan for it a bit better though. In a previous newsletter we did talk about safety while prospecting – please don’t underestimate this extremely important subject when you are prospecting, here is a link to that newsletter. Safety in the bush while prospecting. Get yourself a Satellite phone....We use an Inmarsat Prepaid Satellite Phone. Also, get a personal EPIRB if you a travelling alone – they only cost around $330 check at Rob at the Prospectors Pick in Bunbury or Jeff in Perth at Reeds Prospecting, Finder Keepers in Kalgoorlie and look at the safety gear and options so you can look after yourself in the bush. Please be safe in the bush this prospecting season! Gold Prospecting Seminars Booked out - Sometimes Vacancies DO become Available. The Gold Prospecting Seminars in Cue are booked out for 2015, thank you to all those people who very strongly supported us again this year. If there is a specific date that interests you we can put your down on the waiting list because for some reason some people who book sometimes cancel when the Deposit invoices are sent out. If you are interested in a seminar still then keep your eye on our newsletters and if a vacancy does come up we will advise you about 6 weeks before the seminar is due to happen. This is so we can provide you with our comprehensive maps and suggestions package for places worth detecting with a Section 40E on Prospecting tenements with plenty of time to apply. For various reasons we do get a few people cancel on every seminar when it comes to the invoices stage. Don’t let anyone tell you the gold has all been found, that is just not true, the new Detectors enable you to find gold nuggets at pretty much all the places where gold has been “Cleaned Out” in the past. It's time you started to prepare for your 2015 prospecting season so we will have a short series of newsletters between now and April to help your planning. Where to Find the Gold and get Free Geological Maps – in this newsletter . Downloading Maps and Shapefiles for Geomap. Where to Find the Gold in 2015 - The First of the Information Series. The First and Most Important Question - Where do I find the Gold? However, you don’t have to wander blindly around the bush anymore checking outcrops and sediments and panning off a sample here and there in the creeks like the old timers did to find gold. There is a mass of data and information to help you target gold and it is a matter of pulling it together to target locations where you are likely to find some gold. Research Local occurrences of gold ie. What are the local occurrences of gold occurring in, what type of structure or rocks or the type of gold, alluvial, secondary gold in laterites, primary gold in quartz or ironstone outcrops? Get the GPS points of Old Gold Mines i.e. Where gold has been found before - gold will be still found in that place. Understand the Geological Structures of gold Deposits – what are the geological structures locally in the area where you are travelling that have hosted gold deposits? Look for Streams, Gullies, saltlakes, calcretes, laterites downslope or downstream of gold deposits are very good targets for the Gold nugget metal detector operator. The classical “salt and Pepper” rocks and deposits of quartz and ironstone down from outcrops of quartz, ironstone and greenstone are wonderful places to search particularly if there is old gold mines or open cuts in the area. A lot of this information is available from Geological maps which are your very best friend in targeting potential gold areas. Much of the information is available on the Geological Maps depending on the detail of the Map eg 1;100000 maps will provide local gold mines as well as the geology in the area that you need to look for to target gold. How To Obtain and Download Free Geological Maps. Geomap - a Powerful Tool to Target Gold Localities - Legally! Geomap too is a wonderful program for downloading shapefiles like Mines and Geological maps as well as Tengraph tenements to discover the best localities for finding gold legally – but more of that in a future newsletter. Structural Geology - The presence, association and relative distribution of structural features including for example, faults, folds, intrusives, metamorphic and altered zones, and geological boundaries. Then you will really start to nail the exact localities. However, that starts to add a level of knowledge, lots of time and research that is difficult for the normal recreational gold prospector. GoldTracker Does All that Analysis For You With A Click of the Mouse! REMEMBER that this is exactly the sort of analysis that Goldtracker provides. ... AND GoldTracker provides a simple score that tells you exactly what the potential of gold is (in roughly a 850m radius surrounding the location you select) in pretty much any area of importance in WA. If that area does not have a high enough score then you can search for the NEAREST BEST PLACE for gold potential in the area – So Why waste your valuable time on research when it has been done for you. That shortcuts all the paperwork and analysis that you need to do to get to the same conclusion and find the BEST PLACES TO TARGET POTENTIAL GOLD LOCALITIES. GoldTracker - Gold Prospectivity Analysis software program. Following on from that is of course the Question, “Where am I allowed to go prospecting to get the Gold Nuggets?” and we will deal with that question in a later issue but in plenty of time for you to do up a section 40a before the gold prospecting season. ps – Start your planning for finding gold nuggets in 2015, the season is not too far away!